ON-AN.com, What is your reason to visit North Sumatra? Most of the tourists want to see Toba Lake. Well, it is common sense. Apart from it, you can learn about the culture. Batak Tribe has many interesting things for visitors. For instance, it is the Batak House. The other name is Bolon House. Originally, it belongs to Batak Toba Tribe. However, the government has chosen it as a traditional house of North Sumatra. It also becomes a signature house of any Batak Tribes in such province. The locals call it Bolon. It has a shape of a rectangle. When it comes to design, it is similar to many other traditional houses. The house applies the concept of “Panggung House”. It can accommodate 5-6 people. That means the size is quite big. Many tourists come to North Sumatra to witness this majestic building. In fact, there are many Bolons all over the province. It is because each Batak village has them. Is it only about the design? You can learn many things from Batak House. Actually, it has some philosophical values. First, it is the design of the door. It is a little bit lower than other houses. Why is that? Before entering the house, the guests should lower their head. This is the sign of respect to the owner. Next, it is the stairs. It has the same philosophy to that of the door. In order to climb the stairs, you must lower your body. It also shows the respect to the host. All the philosophical values of Batak House are quite interesting. Next, it is related to the parts of the house. The 3 parts represent different dimensions or worlds. First, it is the roof. The locals believe it as the realm of the Gods. Next, it is the base floor. It represents the realm of the human. Another part is the pit. It symbolizes the realm of the death. Recently, some local people use the pit as a pets’ cage. These include chicken, pigs, and goats. So, where can tourists see this majestic house? As mentioned before, it is widely available in some villages in North Sumatra. For example, you can visit Tomok Village. If necessary, you need to carry a camera. Batak House becomes a good background for photography. Some houses even feature Sigale-gale doll. It appears to be a scary doll for tourists, though. Not only it features Bolon House, but it has some local souvenir stands. You can buy unique items of Bataknese. One thing, the prices are expensive. 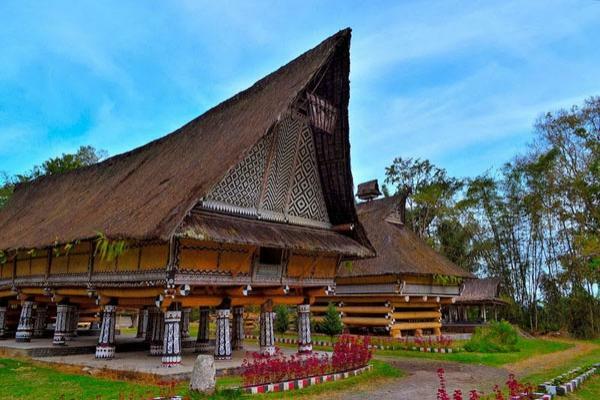 In order to see Batak House, you need to visit North Sumatra. You can find it in some villages and museums. If you come from Jakarta, you need to head to Medan Airport using a plane. It is also reachable from other cities. Once you arrive at Medan, you can use local vehicles to visit villages in Tobasa or nearby areas. It is also wise to talk to your tour agency. He can help you find the best location to see Bolon House.